What was started by Dave Courvoisier two years ago as National Voice Over Awareness Month has grown into VOAT (pronounced “vote”). VOAToday reminds me that I want to put another Buffalo Niagara or Western New York Voice-Over Meetup together this month. We shouldn’t need an excuse to do it but if VOAT provides one, well, that’s good enough for me. 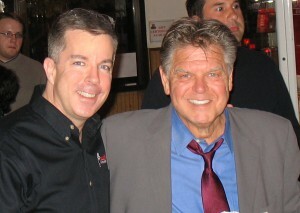 National Voice Over Awareness Month spurred me to put one together in 2010 so we’re about due. LAS VEGAS, NV, Sept 1, 2012: Voice actor, Blogger, TV News Anchor, and Social Media advocate Dave Courvoisier announces a September promotion to help build an informational database that benefits voice actors everywhere, while encouraging a sense of community and providing a fun program offering valuable prizes. By lending a “VOAT” to a specially-designed website, voice-actors can contribute to a shared informational resource based on their answers to weekly questions. Doing so automatically puts their name in the running for some handsome weekly prizes specifically designed for voice actors. VOAT in 2012 — building on last year’s success — plays off the â€˜VOTE’ homonym by asking voice actors globally to â€˜VOAT’ on 4 different issues impacting voice actorsâ€¦one for each week of the month. The â€˜VOAT’ consists of an answer to a “question of the week”. â€˜VOATing’ in this manner allows the website visitor to be eligible for specific voiceover-targeted prizes provided by well-respected voiceover equipment, service, and client-seeking providers. What does your recording studio look like? Provide a picture and a brief description, history, or special features of which you’re proud. People responding, are required only to provide their name, and an answer (email is required to be eligible for the prize). No data is collected on the visitors for marketing purposes. The site also allows respondents to upload a picture or soundfile to accompany their comment if they wish. Prizes for the month-long event are generous. High-profile businesses readily recognized by voice actors everywhere are contributing substantive prizes, including for instance, a free year’s premium annual membership to Voices.com, an annual subscription to Voice123.com for both male and female, a choice of demo or consulting services from Edge Studio in NYC. In addition, John Florian of VoiceOverXtra, is offering a free pass to an upcoming webinar, and Cliff Zellman, Founder and Organizer of the Dallas Voice Acting Meet Up Group (DVA) is contributing gift certificates from an online equipment site. 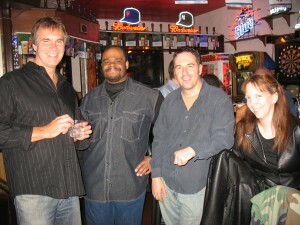 EWABS’ George Whittam & Dan Lenard, and the Voice Acting Academy are also contributing. This is not a complete listing of prizes. We’re also pleased to announce that Harlan Hogan’s Voice Over Essentials.com is donating a new 3rd generation Porta-Booth Pro audio studioâ€¦just now being released! Sponsors include: Voices.com, Voice123.com, Bodalgo, World-Voices Organization, Harlan Hogan’s Voice Over Essentials.com, VoiceOverXtra.com, The Dallas Voice Acting Meet Up Group (DVA), Bettye Zoller, The Voice Acting Academy, EWABS, and Edge Studio, Julie Williams, Deb Munro, and Bob Bergen. “Voice actors are an extremely supportive, encouraging and giving people. Many of them have enabled and sustained my VO career, and this is an attempt to celebrate the generous nature of the business, while helping to inform and create a community of like-minded peers,” adds Courvoisier. The site will become “live” on Labor Day, Monday, September 3, 2012. 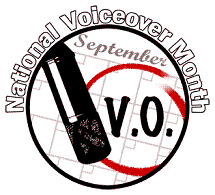 “In 2010, the NVOAM (National Voice Over Appreciation Month) event struck a chord with voice actors everywhere who agreed it was time to celebrate the profession of voice acting,” notes Dave Courvoisier. “With very little foreknowledge, hundreds of voice artists around the world responded with enthusiasm to the month-long â€˜appreciation’. A central website (http://www.nationalvoiceovermonth.com) collected the support of voice talent, showcased a series of collaborative Public Service Announcements, and kept a running and busy calendar of voiceover happenings in September.” The VOAToday event is a direct result of this early foray into online VO community-building. 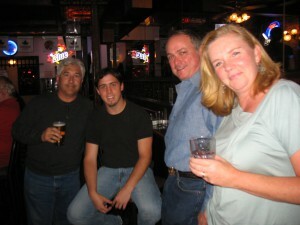 But the evening turned out much better than that with over twenty people coming out with about a week’s notice. Some folks I knew and some folks I didn’t but much like the Toronto Voices of Vision Mixer, our voice over industry breeds instant familiarity. What a treat it was for me to entertain my good friend Bob Souer in my hometown after all the years of me coming to see him. Still one of the finest people I know. And that really was the point of it for me – not just to socially connect with people I already knew in this industry but also to meet and visit with folks that I haven’t yet met or spent time with…the world’s a big place and I know there are lots of people I can still learn from as long as I take the time to meet them. My thanks to everyone for showing up but especially my friend and teacher Pat Fraley who has taught me a lot over the years – not the least of which is kindness goes a long way in this world; Pat has it in spades. 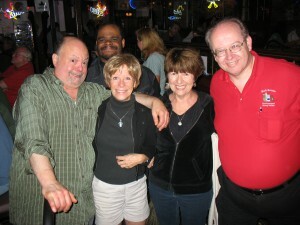 Here are just a few of the other folks who joined us Saturday at JJ’s. As God as my witness, I thought turkeys could fly! 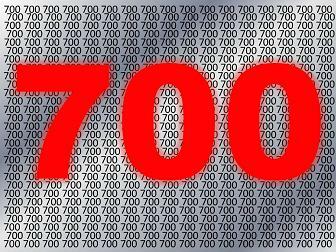 As God as my witness, I had no idea that starting a blog all those years ago would result in 700 posts. I like to write but that’s not the challenge; the challenge is if people will like to read. Many of you do, catching this blog via subscribing to Voxmarketising through RSS or reading links on Facebook, Twitter or LinkedIn. The comments, retweets and repostings really make me happy. Not egotistically happy but really because someone took the time to read about my thoughts on voice over, marketing or advertising and thought they were worthwhile enough to share with others. That kind of endorsement and support cannot be quantified. So whether you like the logo posts, or the Fauxditions, or the videos or the Faffcon stuff or more recently the National Voice Over Month stuff, I keep writing about those type of things and more going forward. None of that stuff existed when I started. God only knows what lies ahead for this blog in the future. Boy, I hope its all good stuff! agents who celebrate national voice over month win! 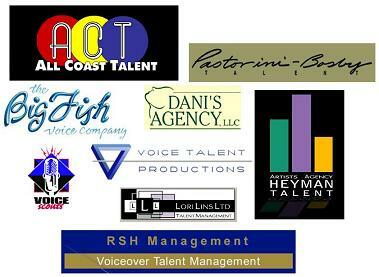 I’ve been fairly fortunate in my voice over career to have partners in my voiceover business. They are my voice over agents who represent me and hundreds like me to thousands of potential clients for each new voice over project that comes out. I speak to all my agents fairly regularly and I think most even know my name (kidding! – just agent humor). They do know my name, my voice talent and I am fortunate to have gotten business from and made money for these valued partners. Now, as we begin September’s National Voice Over Appreciation Month (or National Voice Over Month, as I prefer to call it so I don’t have to type as much) I thought I would mention how I think Voice Over Agents can benefit from this month long celebration. Maybe these tips might work for your agents too. The challenge in promoting talent within an agency is with so many people represented, it’s tough most times to just promote one individual talent to a full data base of clients. The other talents get a bit perturbed if they are not the “chosen one”. That’s where National Voice Over Month comes in…sending out a direct mail piece (letter, postcard or even email blast) to your database of prospects and clients about the National Voice Over Appreciation Month celebration that directs readers to your list of talents is a great and simple way to drum up business. Often times, when outbound calling (aka “dialing for dollars”), agents fish for something to talk to a potential or even regular client about. Once a job is over, an agent has to search for the next hit. That can be just as difficult and awkward as it sounds but its part of the skill set agents bring to the table – that ability to keep the conversation going. Should they do the direct mail piece our to prospects and clients – what would normally be a cold to lukewarm call immediately becomes a warm call – the agent has something to talk to the client about. That conversation could go somewhere or nowhere but at the very least, the agent got in front of the prospect at least one time if not two times in one month’s time and kept the dialogue going. That’s what sales is all about. My team is good at that – I hope yours is too.